Cumberland County Democrats – Keeping Maine blue! The Cumberland County Democratic Committee will meet on Sunday, December 2nd at 3:00 in the Spruce Room at the Westbrook Community Center (426 Bridge St). Please come early and celebrate our election successes, we’ll be serving light refreshments between 2:00 and 3:00. Feel free to bring along a homemade sweet or canapé if that’s one of your fortes. Tentative Agenda: Debrief 2018 campaign, election of officers for 2019-2020, review of MDP meeting and plans, initiate planning for 2019- 2020 activities. Speakers – TBD. The Cumberland County Democratic Committee would like to congratulate the new and returning delegates to the state committee. We would also like to thank all the wonderful volunteers who helped with the Cumberland County Caucus at the Maine Democratic State Convention. Victory in 2018 in Maine runs through Cumberland County. 90,000 of the Democrats in Maine live in Cumberland County. Our efforts impact state, local, and national elections. The Cumberland County Dems kick-off meeting for membership year 2018-2020 will take place on April 22, 3-5pm, Westbrook Community Center, 426 Bridge St., Westbrook. The primary item on the agenda is the election of delegates and alternates to vacant Cumberland County slots for the MDP Convention, May 18-20, in Lewiston. If you could not come to the March 4 caucus, you still have a chance to become a delegate. Shortly we will send out notification that a pre-registration website will be turned on by the MDP to pre-register folks who are interested in becoming delegates or alternates but who cannot come to this meeting. Pre-registration is not necessary for those who will be in attendance. Members of the CCDC elected at their caucuses will the the only ones voting on delegates at this meeting. Over 200 members of the CCDC were elected at the caucuses, and over 110 are new activists. Another item on the agenda will be a brief orientation to the work of the CCDC and how a county committee fits into the overall structure of the Democratic Party in Maine. We will be doing more at this meeting, but we’re currently confirming a speaker and other agenda items. If you want to get involved with an activity before the April meeting, the MDP and CCDC are sponsoring a Run Local training this Saturday, March 24, 9am -12:30 at the Westbrook Office, 90 Bridge St., Suite 305. If you have ever thought about running for local office or wanted to improve governance in your town by helping someone else run, this is a chance to learn and start helping Democrats fill all 88 local offices up for election in 2018 in Cumberland County. Go to https//:www.mainedems.org/events and follow the trail to the registration page and sign up. (We need a count for training materials and Holy Donuts.) If the link is wrong (perfectly possible), just go to the Maine Dems site and browse through the Events pulldown. Welcome to our new members, and to our returning members, thank you for your dedication and work over the past few years. Exciting times ahead! Preregistration: You may preregister at the Maine Democratic Party website. Conversation with candidates for Cumberland County District Attorney and US Senate. Election of female delegate to DSC to fill remainder of term. Discussion of caucus, convention, and activities for 2018 campaign. In 2018, Mainers will be electing a new governor. We are fortunate to have a number of talented Democrats stepping forward to run. The Lake Region Dems, supported by the Cumberland County Dems, are sponsoring a series of meetings — conversations — with our Democratic candidates for Governor. Each conversation will be held at The Little Meeting House, 719 Roosevelt Trail, North Windham. Refreshments will be served at all meetings. Get ready to have a conversation with our Democratic candidates! With your help, one of them will be our next governor. For more information, please contact Maurie Hill with the Lake Region Dems at 207-642-6065 or Rachel Hendrickson with the Cumberland County Dems at rhndrcksn@aol.com. Come meet and eat with your fellow Cumberland County Democrats at the Kiwanis Beach in Standish Sunday July 23rd at 2:00pm. We’ll supply the hamburgers, hot dogs, veggie burgers, chips, soft drinks, and water. Bring desserts! There is 1000 feet of lakefront beach. So bring your swimsuit to the picnic. There is changing rooms and bathroom facilities. Also there is parking. 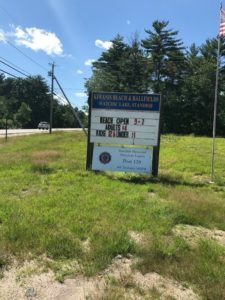 The Kiwanis Beach is located off of Route 25 in Standish after you pass the junction of Route 113. Beach fees: 13 years and older is $4.00; 12 years old and under is $1.00; parking is free. Aside from the beach entrance fee, the picnic is free. You may let us know you will be joining us through the event page at ActBlue. You may also use that link to support the event at one of our donor levels: Sponsor, $100; Host, $50; Friend $25. The Cumberland County Democratic Committee will hold a fund raising bowl a thon May 24th at 7pm at 33 Elmwood in Westbrook. 33 Elmwood is a new bowling alley off of route 302 at Prides Corner. The facility offers ten pin and candle pin bowling as well as a bar and restaurant. Participants (bowlers) are asked to collect pledges against the number of pins they knock down during one game. For example if one scores a 100 and gets a pledge of ten cents pin, then the person who has pledged will donate $10 to the Cumberland County Democratic Committee. If you cannot collect pledges you are welcome to bowl and pledge on your score. For more information and pledge sheets contact Harlan Baker at hbaker@maine.edu or call 207-712-0228.